5 Days/4 Species/$1500 - Possibly The Best Hunting Deal EVER! The best value in hunting Africa we have ever seen is available through Discount African Hunts. The package includes 6 nights in a 4-star lodge, 5 full days of hunting, and trophy fees for gemsbok, Kalahari springbok, warthog, and baboon. It also includes all food, lodging, services of a professional hunter, tracker, daily laundry service, all licenses and permits, and airport pickup and drop-off from Windhoek. (WDH) An observer can be added for only $150 per day and rifles can be rented for $40 per day. You can also harvest additional species at the usual rate as per current price list. This very affordable discounted safari hunting package hunt in Namibia is offered by a well-established outfitter that has an excellent reputation. There are 109,000 acres (237 sq. miles) of prime free-range habitat that has thousands of trophy animals residing on it. Namibia having the greatest free-range plains game hunting on the African continent, and you will be hard pressed to find a better place to hunt a variety of species than here. The diversity of native species on this ranch is typical of the diversity of species found in Namibia. The109,000-acre hunting area is located in North-central Namibia. The area features natural wild animals that have adapted to the harsh conditions of the Namibian desert and mountain environments. The main lodge is a 2-hour drive from the Windhoek airport. The terrain consists of a mix of mountains, valleys and vast plains. The diversity of the terrain supports a large variety of antelope, African cats and birds. More than 20 different species of game can be hunted, including leopard, Hartmann zebra and klipspringer, which are all endemic to Namibia. This safari will primarily be done by driving and spotting or driving and then hiking to vantage points with a good view and glassing for trophies. You and your PH will decide on a plan and begin stalking on foot until a suitable shot opportunity is achieved. You should be in average to good shape (2-3 on a 5 scale) to be successful on this safari. This area of Namibia produces some exceptional trophy quality. The outfitter’s Greater Southern Kudu’s average around 50’’ – 55” while some bigger bulls exceeding 57” are taken annually. The gemsbok in this area average between 36” – 41” with the females typically having a little more length and the males having thicker bases. 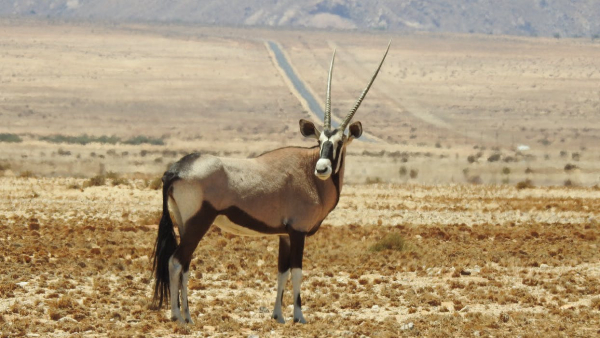 There are also good populations of other species typical to Namibia on this concession and there is a good chance you will return home with some exceptional trophies. For more information on how to book this exceptional value in safari hunting, call 866-256-7846.